HeLa Flp-in Trex cells stably expressing GFP-empty, GFP-Rab8A, GFP-Rab8B and GFP-Rab13 were induced by Doxycycline (0.1μg/ml) for 24h. 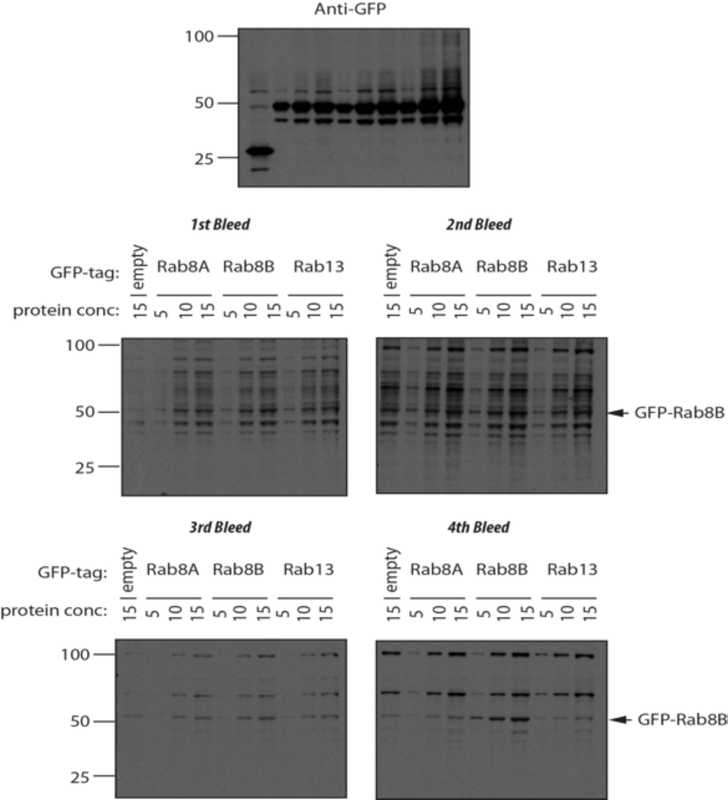 The indicated protein extracts were subjected to SDS-PAGE analysis before transferred to nitrocellulose membrane and immunoblotted with Anti-GFP antibody or anti-Rab8B antibodies (bleed 1-4) overnight. Binding of the primary antibody was detected using anti-sheep (1:10,000) and visualised with ECL. Note: Only detect overexpressed Rab8B with 4th bleed.